I've noticed that birds are what's selling on Etsy for some time now. I thought it might be fun to try my hand at birds, but then I didn't want to be painting just for the market, just to sell my art. Somehow I've felt like I'm selling out if I do that. It's a battle. Do I paint for myself or for the market? I guess it depends on how much I want to sell my art, right? Well, I've taken the plunge and tried my hand at birds. I've done roosters before, but nothing else. It's more challenging than I expected. This bird on a branch is in no way my best work, but I'll still show it. I don't want this blog to be about being perfect all the time. It should be about growth. So here ya go. 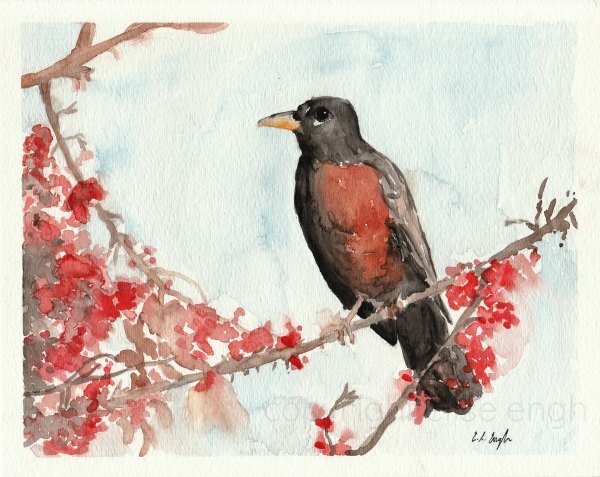 I hope to be growing my skills in bird painting in the future. And I'm ok with that. Maybe I can find joy in painting something even if it is mostly to fit the trends. We'll see! 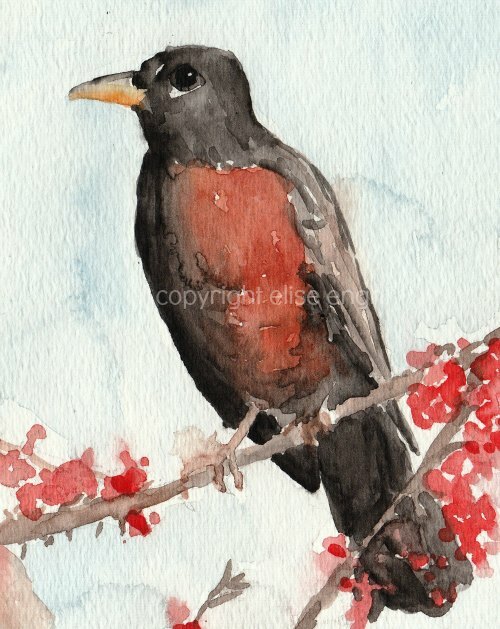 If you enjoy painting birds, then I see no problem following the market. I think it's also a plus that you haven't done a lot of birds before and trying them will only give you more experience and improve your abilities. Go for it! Beautiful job. You are very talented! 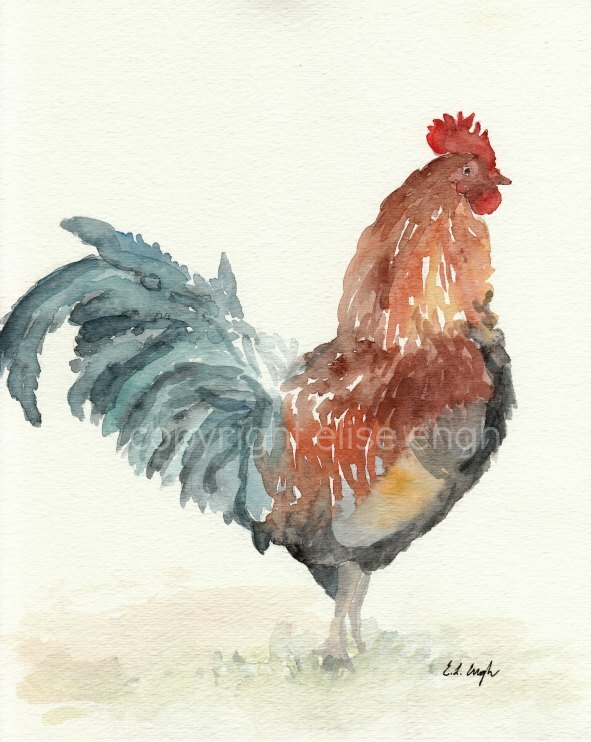 Oh Elise I love that rooster!!! Fabulous job!! Your robin is cute too. I don't understand the whole bird obsession, I've never really been a fan. I do like your rooster, but I prefer your other watercolors. I think if you have a niche you shouldn't feel the need to follow the trends to make sales. People will find you and love you for what you offer. Love your work, btw, and I used your cheat-sheet, 1 color baby portrait last night - love it! Hi Elise, my compliment to your talent! Love birds but both are beautiful! I love your bird and I hope you are going to sell that one too. Like you said it's not about being perfect. It's about the journey and I'm glad I found you on Pinterest. Already visited your shop too. This comment's a little late, but I, too, love the rooster. I think artists throughout history have struggled with this dilemma. Nothing wrong with making money from your artwork to buy supplies. You don't have to devote yourself totally to birds, but why not cash in on what the market wants? People in all sorts of jobs do work they don't particularly enjoy to bring home a paycheck. We don't think of them as selling out.